Teachers – Our lead teachers are Montessori trained and hold an N.C. Early Childhood degree. They are knowledgeable in child development and therefore understand the stages that an infant goes through as he/she grows. Environment – Our classrooms are bright, warm, and “homey”. They are designed to allow children to navigate and explore some of their earliest milestones, including sitting, walking, eating independently and early language skills. The classroom invites the children to develop independence, confidence, and a sense of community through activities that promote motor skills, mobility, order and self-expression. Curriculum – Because of the unique nature of the fundamental needs of infants and young toddlers, our day in the Infant Room is less structured than older toddlers. We respect each child’s developmental process and schedules are based on individual needs. 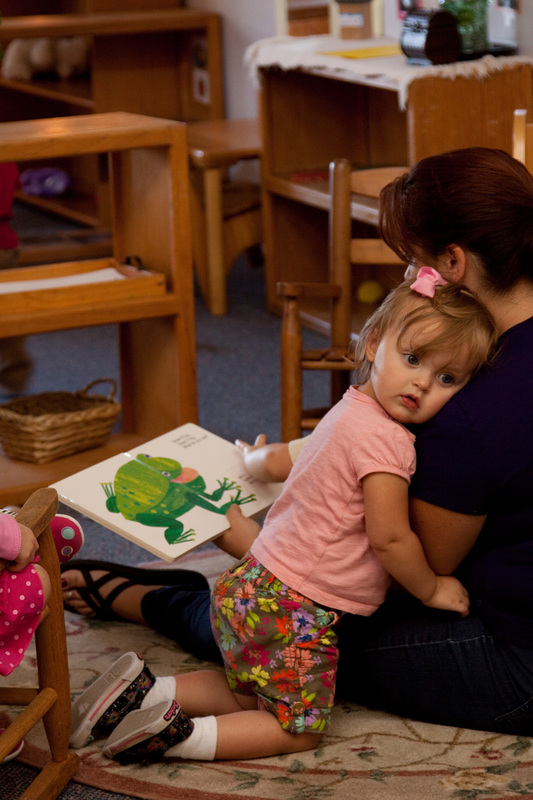 Language Development – This is an integral part of the Infant program. A teacher’s role is to constantly introduce language through the use of words, inflection, tone, and body language. Infants gather their first understanding of the world, and thrive through this interaction. Atmosphere – Finally, we create a warm, nurturing, and loving atmosphere that surrounds the infants and is essential to their development. We treat them with respect in every encounter. Parent Partnership – We respect the fact that allowing someone else to care for your child is a very difficult undertaking. Therefore we work hard at developing close relationships with parents through an open door policy and frequent communication. Parents are invited to come in and spend time visiting with their child in their environment. The teachers keep detailed observational notes for each infant to share with the parents. Close communication between parent and teacher is a cornerstone principle we embrace.